This chapter may serve as a wake up call to some of you. It will also be non-traditional in nature, and I will give you my realistic recommendations on getting fit, and staying fit for the fight. To put it bluntly, if you are one of those people that think you will just be able to “shoot someone” if someone threatens you, think again. I have been exposed to far too many concealed carry holders who pay little or no attention to fitness, because they carry a gun. They argue that the gun they carry is the great equalizer, and will even the odds. Unfortunately if those same individuals are involved in a fight for their life, and the situation begins by someone punching them in the face or grabbing them, they might realize that accessing a firearm is very tough, or nearly impossible. Even in situations where there is no physical contact with the threat, most gunfights are physically taxing from the stress. The point is that if you plan to carry and defend yourself with a rifle, and fail to take the act of getting physically fit serious, you might lose. I have met and trained with some of America’s elite warriors, both in law enforcement and the military and one thing that I have found in common is their fitness level. These guys and gals are fit, and they work on their fitness daily. Fitness is critical to your survival. If you have not addressed your own fitness level, consider this your wake up call. Hopefully you’re sold on getting fit, and have a desire to travel down that path. How do you develop your fitness for a fight, and what is important? In today’s age there seems to be a new fitness gimmick or workout that comes out every day, but most are simply repackaged materials that you could have found fifty years ago. Some experts believe that the most significant fitness strides in history were made during the 80’s, especially in the competitive arenas like powerlifting. I have experimented with a variety of workout programs and exercises and will recommend some things that I have found to work. One thing that I want to point out is the fact that exercise alone will not give you what you need. In order to be truly prepared, you need to learn how to fight. This means finding someone who can teach you the basics of physical self-defense. If you follow my recommendations, you will gain a significant level of fitness development during combatives training, without doing traditional exercise. Most people interested in getting in shape approach fitness like this: Build a base of strength, flexibility and cardiovascular fitness in the gym, often with bodybuilding type movements and then supplement that base with combative/martial arts training. I am going to recommend the opposite: Build a base of strength, flexibility, and cardiovascular (cardio) fitness that is directly relevant to fighting as well as inclusive of technique (by training in combatives), and then balance/supplement that with strength training exercises and a focus on flexibility. The key word in that last sentence is “strength,” more on that later in this chapter. Also, notice that I did not include cardiovascular fitness as a supplemental exercise, simply because you will develop a high level of cardiovascular fitness during your combative training. If your idea of cardiovascular fitness is standard cardiovascular exercise done on a machine, I strongly recommend selling the elliptical or treadmill and buying a heavy bag instead. Try punching a bag for thirty-second intervals with short rest periods in between rounds for 25-40 minutes and you will get a great cardio workout that benefits you much more than running on a treadmill. To put it bluntly, I can take someone who is really fit and strong from traditional methods of exercise and place them in a three-minute round of medium intensity sparring and they will be extremely exhausted at the end of it. Some won’t even be able to last the three minutes, and will gas around the midway point. There is a big difference between a medium intensity sparring session and a real fight, so imagine how fast a fit person will become exhausted during the real thing. The person with no fitness level at all has really no chance unless the fight ends extremely fast. Getting ready for a fight requires a completely different fitness approach than the average gym dweller uses. If you want to survive the fight, make sure you prepare properly! I have used the term combatives multiple times, and should define that term. I began training long ago in a system called Okinawan Freestyle Karate (we called his system “bare knuckle full contact Karate) taught by Tommy Mossman in Jacksonville, NC. I considered myself a martial artist, and trained religiously. I thought I was prepared for anything until I had the opportunity to train in a system called Gracie Jujitsu in Torrance, CA. You may recognize the Gracie name, as Rorion, Rickson, Royce, and a variety of others in the Gracie family modified a system of Jujitsu to suit their needs and developed a revolutionary method of teaching their system. Rorion Gracie helped start the first UFC as a testing ground for his system of Gracie Jujitsu. His brother Royce fought and won in the first several UFC’s, demonstrating the effectiveness of the system, and the lack of ground fighting knowledge by most of the mainstream martial artists. Carrying a gun for your self-protection is smart. Realizing though that there are more dynamics possible than just drawing and shooting is priceless. Most of those dynamics reward you if you have a high level of fitness. Royce’s multiple wins in the UFC. Thinking I had some skills, I was humbled by the newest students at the Gracie academy when we “rolled” (grappled on the ground). Even though I was still very confident in my striking skills, I knew immediately that if I were to end up on the ground with anyone skilled in this system I would lose. And this began a lifelong search of training that would help me reach an endpoint rather than focusing on a certain “art” or regimented method of training. My endpoint goal was surviving and prevailing in a real life fight. So for the purpose of this book, when I use the term “combatives”, I am referring to all skill sets that will help you win a fight. Combatives consist of defensive skills (defending against an attack), striking skills (to counter attack), grappling skills (both standing and on the ground), and “in fight weapon access” skills. This is the often-overlooked area that even most hard-core fighters do not train, and that is the inclusion of training weapons during combatives training (such as red guns and training knives). So what fitness specific assets are required for a fight? Other than generally getting in shape, what matters in a fight? Pavel Tsatsouline, Chairman of StrongFirst and former trainer to the Soviet Spetznaz (www.strongfirst.com) makes a point of focusing his students on strength before anything else. The name of him company says it all. The reason behind that is strength is the foundation to anything that relates to athletic (i.e. warrior) performance. Pavel is well knows for being one of the first to introduce the kettlebell, a serious yet simple strength training tool to the west. He and many of his athletes possess a level of “wiry strength” that is unsurpassed by many of the heavily muscled bodybuilders you would find in a gym. Pat McNamara, former Delta operator (U.S. Army Special Forces) calls it “a performance-focused approach to maintaining your combat chassis” in his first article in Recoil magazine (Recoil Magazine, Issue 9). McNamara talks about the missing links in his article and states that while Crossfit and other fitness approaches have changed the way we view fitness, but that they still miss the mark. He advocates circuits that work the neglected areas, and recommends learning the Olympic lifts for their strength building benefits as well as caloric challenges and increased hormonal responses (testosterone and human growth hormone) they give you. Pat takes a slightly different approach to his workouts and breaks them down into: Speed/Quickness, Power, Strength, and Hypertrophy workouts respectively. You can find out more about Pat at (www.tmacsin.com). Everyone has a slightly different approach to fitness, even when you study elite level trainers. Don’t get caught up in trying to find the “perfect workout” when it comes to developing fighting fitness, as there are many different ways to reach the end goal. Instead focus on attributes and the principles behind those attributes that will help you reach your goal. I can distinctly remember a day on the range with a student group that was made up of various students from the Naval Special Warfare community when one of them noticed a long aluminum pipe lying on the range. He looked at me (I am relatively muscular and think of myself as fit) and challenged me to do a “get up” with the pipe in one hand. I am not certain of the weight of the pipe, but it was relatively heavy and long which made it awkward. I asked the heck a “get up” was and he basically said to lay down and put the pipe in one hand, and then to stand up while keeping it higher than my head. Now, understand there is a much more sophisticated way of explaining and doing a “get up” (Turkish getup), but those are the basics. Anyway, I laid down and grabbed the pipe and managed to make it almost to my knees before giving up. The truth was that even though technique is part of that equation, pure whole body type strength is the other. I did not have it. My buddy then demonstrated the move perfectly with the pipe above his head. The point is that my strength training had something missing, and the pure strength this frogman demonstrated on the range that day played out well during the combatives portion of the class later in the week. Lesson learned: strength rules in a fight! High strength to weight ratio. I am talking about pure functional, whole body strength that should be trained with a variety of methods, but most importantly the focus should be on getting strong. Grip strength. This is an often-overlooked key area that has specifically helped me in real fights, and in training. Midsection (core) strength. This was really what I was missing most in reference to the Turkish getup lesson I learned on the range. I had plenty of power on certain planes, but my midsection was weak and this limited my ability to use that strength. I can attest to the fact that every time I return to grappling (usually jujitsu) I find myself incredible sore in the midsection for the first week, even though my gym routine often includes abdominal exercises. Cardiovascular energy systems strength (specifically applicable to higher heart rates). Now, don’t picture yourself having to get on a stationary bike to develop this, instead use your time wisely and develop this strength while getting stronger or improving your combative strikes. A non-traditional workout that improves two of the four key attributes. 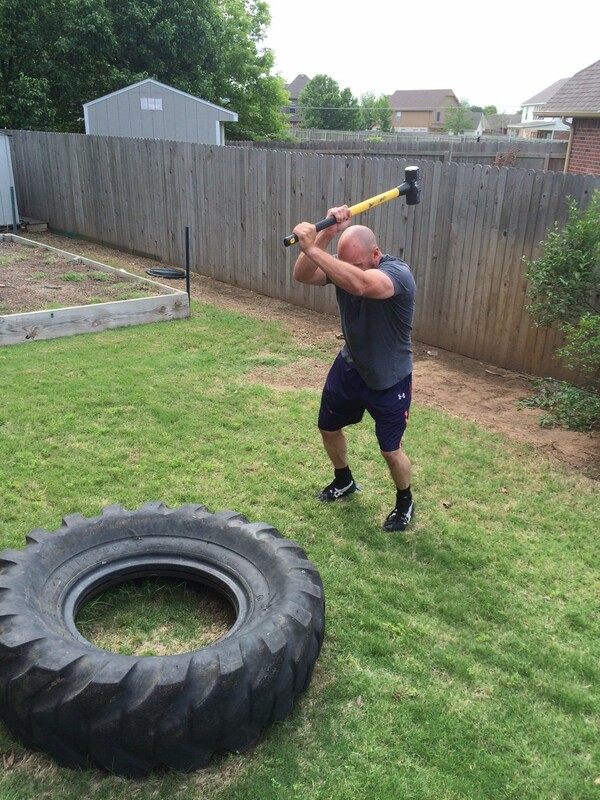 Spend 20 minutes beating on a tire with a sledge hammer in intervals of 1 minute work/rest, and I promise you will improve your cardiovascular fitness, grips strength, and midsection toughness. Developing the above can be accomplished in many manners. Most of us do not have the time to spend hours in the gym each day, and even if you could it would not be necessary. Thirty to sixty minutes of training each day will easily allow you to build the fitness levels you need. Use your time as wisely as possible, and focus on functional training by actually doing the things you want to get better at. Bodyweight and/or functional movements rule. This means if you are pushing, pulling, or pressing your bodyweight (or more) in the different planes of movement, you will be heading the right direction. Repetitions should be kept in the 3-5 ranges, and failure on any exercise should be avoided. Strengthening the muscle is the goal, so more sets of a lower repetition ranges will accomplish this better than higher bodybuilding type repetition ranges. Keep in mind that muscle without strength is functionally useless and burns energy needed for the fight. Additionally, working the muscle during sets to the “burn” or complete failure is regarded as a bad idea by most strength trainers (including Pavel Tsatsouline, mentioned above). Trainers argue whether training to failure is ever a good idea, and the science is a bit blurry in that area. One thing they are pretty consistent about is that training with lower rep ranges, stopping several repetitions before failure, and piling the weight on will make you strong. Pick movement functional exercises that require the use of the entire body and midsection at the same time. Examples are the getup, kettlebell swings, deadlift (sumo), muscleups (if you are strong enough). Additional selections would be movements where you have to push, pull, or press your body weight up without the support of a bench or device. These include push-ups (and variants), pull ups, pike presses, etc. This area will be greatly enhanced by your heavy bodyweight exercises, as well as time on the range with your rifle. Just drilling for a couple hours (dry fire or live fire) with your AR will wear your hands out and strengthen them. One of my favorite grip and wrist tendon strengthening tools: “Pot stirrers” I use a 10 lb sledge and pretend I am stirring a pot with the handle. pick a gripper (or any hand strengthening exercise) and perform about 50-60% of the total maximum of your repetitions numerous times per day for numerous days per week. So if you for example can close the number 1 gripper ten times, then you would do five to six repetitions numerous (ten) times over a given day, and repeat that several days during the week. I have been using this method in the off-season (when I am not shooting competitively) for years now with success. 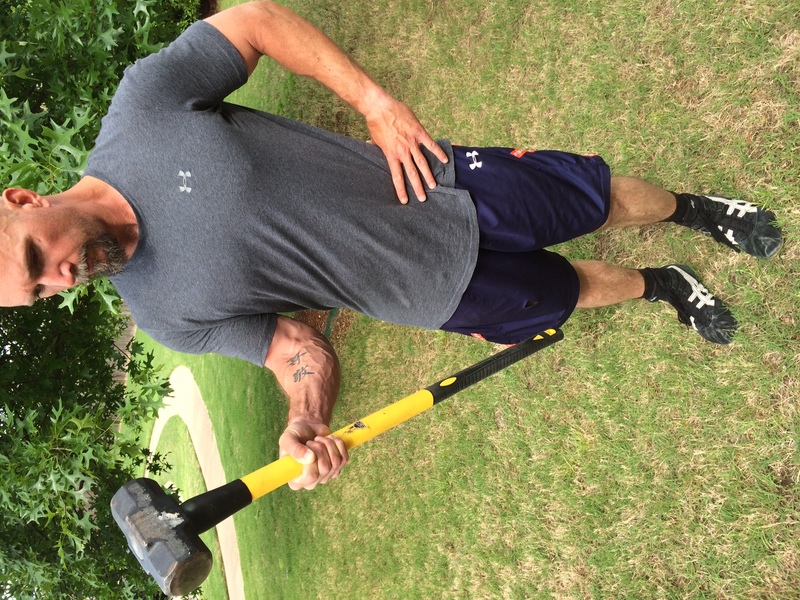 In addition to finger (grip) strength, I also work on forearm and wrist tendon strength with a 10lb sledge-hammer and a variety of exercises. One of my favorites is one I call pot stirrers. The method is simple; I grab the sledge on a specific area on the handle (the farther toward the end of the handle you grip, the harder it is) and hold the hammer end out in front of my body. I then move the handle in a manner like I am stirring an imaginary pot with the handle. A large majority of your midsection (core) strength can and should be developed while you are working on other areas. For example if you follow on of the programs recommended below (Kettlebell Simple and Sinister), the key exercises in the program would strengthen your midsection. If you follow my recommendation and begin to train in any type of MMA gym, then the ground fighting (grappling) develops those muscles as well. Keep the tension up and repetition range down. Most people working their “abs” focus on high repetition for the burn they think will give them that six-pack. While this method has some merits, it does not work as well as keeping the repetition ranges low, tension in the abdominals up (squeeze and keep the abdomen pressurized), and focusing on form. You can literally do half the work and get twice the results. 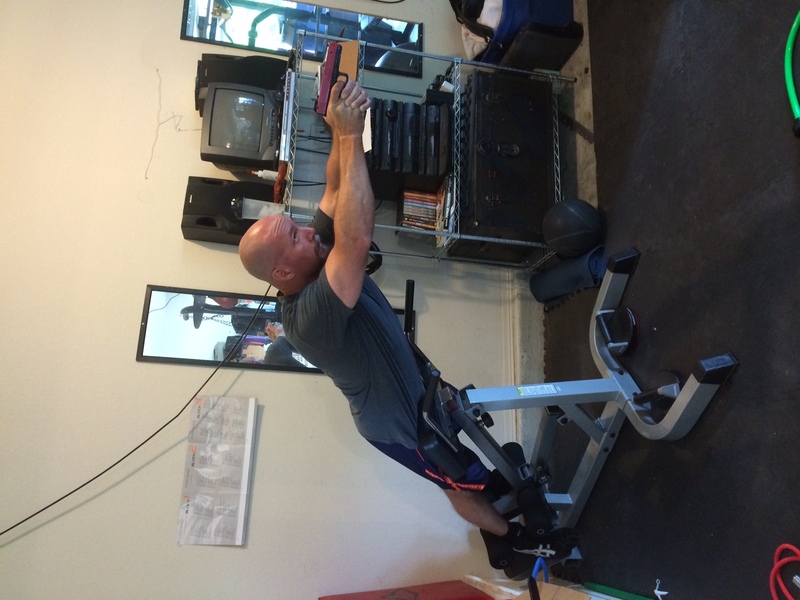 Dryfiring (with a SIRT) while working on midsection strength on a hyper extension machine. Not traditional, yet I am saving time by putting two things together in one session. Cardiovascular energy systems strength (specifically applicable to higher heart rates). The vast majority of my cardiovascular work is done while actually training (with a partner, or in a MMA/Jujitsu type gym, or practicing my strikes. I like to focus on a minute or two of high-level work followed by a rest set that allows my heart rate to recover. Your training doesn’t have to be complicated, just push the pace (safely) and rest in between sets. I wrote up a simple, yet functional interval program that you can use or modify if you like (http://blog.shooting-performance.com/the-ultimate-functional-fightingshooting-cardio-circuit/). Each set focuses on a skill area I want to work on, and in between each set while I am resting and letting my heart rate return, I focus on stretching the muscle group I just worked. The second area that you can use (as I do) to work on your cardio is while on the range. In the live fire drill section, the Moving Mount Drill is one where you will be sprinting and mounting your rifle to practice putting those two things together. I usually do this drill for distances of 75-100 yards, and repeat it five times. After each repetition of the drill, I jog back to my starting point (allowing heart rate to return somewhat). Once again, and way to strengthen your cardiovascular system while doing something functional. One last point on the cardiovascular system is that (per Joel Jamieson in his book Ultimate MMA Conditioning) it is important to do sessions of lower intensity cardio work one or more times per week. This means that the heart should be kept at 130-150 BPM (beats per minute) for 30 minutes or more. Why do this type of exercise? Because the Aerobic energy system is worked at this intensity, and with improvement of this system, the body is capable of generating much more total energy. This increases the overall effectiveness of all energy systems needed for a fight (Aerobic and Anaerobic Energy Systems). For more information on the different energy systems and how to train them, I strongly recommend his book (Ultimate MMA Conditioning, 8weeksout.com). So now that you understand the key ingredients and principles behind functional fighting fitness, you have to select your path to get there. Your options are to follow the rules outlined above or to follow a pre-designed program, or possibly a modification of either. It might be simpler for me to give my recommendations broken down by experience level. Some of you reading this chapter might already be in very good shape and using these principles to keep you there. If so, that is great! Continue down the path you are already on. For the rest of you, read on. Option 1- If you have no experience. Pick one of the three programs below and follow them. I suggest that you cycle through each eventually to get the benefit and education from each. When following them, keep in mind that you can still focus on and mirror the principles discussed above. For example, if you follow the Core Performance or P90X programs, beware of pushing to failure in the exercise if you want to focus on the strength principle discussed above. Supplement with grip exercises as needed. I suggest ordering several grippers from IronMind and working on this by following Pavel’s principle of “greasing the groove” discussed above. Add pot stirrers with a sledgehammer if you have the time. If you are avidly training with your rifle as well as handgun you may not need to add much more to your total workload because remember you are working your grip while shooting. Shooting type interval workouts using a drills like the Moving Mount or Movement Offline type drills found in my defensive handgun and rifle books (Your Defensive Rifle Training Program is coming in Feb 2015) done for numerous sets. Option 2 – If you have some experience. Consider mixing and matching pieces of each of the programs listed, based on your needs and personal desires. If you have not worked with kettlebells or done some of the specialized whole body strength training, I suggest you start with Pavel’s program, and then work through pieces of the Core Performance and P90X programs. Since you are intermediate, you will probably enjoy and be challenged by the bodyweight exercises demonstrated by Tony Horton in the P90X program. Validate the program you choose by testing it against the principles listed above. Remember, those are the keys that will really benefit you in a fight. Option 3 – If you are very experienced. The infamous Kettlebell. A great tool (when used properly) for building a high level of total body strength. experience you are already on the right path. My suggestions will hopefully help you prioritize differently if you are focusing too much on fitness skills that are not as useful in a fight. I have had this problem myself, the key is to simplify and focus on what works. Pick each of the attributes above and develop your fitness training to meet each objective. Select one at a time and build your program, choose the exercises/methods you will use, and schedule the frequency you will use them. For example, in strength training you might select three days to train and use a combination of bodyweight, compound, and functional whole body strength exercises in the rep ranges of mostly 3-6. Since you have experience, I would recommend mixing it up as needed. Switch it up every six weeks or so. I think that the key to staying as focused as possible is to make sure that you are mentally engaged during your training. The more your body gets used to a certain stimuli, the more you will need to change it up. Focus on function as much as possible. Note: Sometimes I use the combative circuit I designed for this session. Midsection/Core– I address this at the tail end of each combatives training section, if I feel the need. If for example I grappled for an hour at the gym with my training partner, I have no doubt I worked my midsection. A Strike Session workout in my home gym would be followed by two-three midsection and neck strengthening specific exercises with as perfect form as I can muster and low repetitions. Grip Strength– During the competition season I handle a handgun daily, and a rifle a couple of times per week. This works my hands and forearms enough where I will usually add one day of grip strength specific stuff to one of the strength workouts I have. In the off-season when I handle firearms slightly less, I add one or more day of grip strength focus using the “grease the groove” method discussed above. Note: I will soon be trying the minimalist total body program designed by Pavel Tsatsouline in his new book Kettlebell Simple and Sinister, but I cannot comment on such a program at this time because I have not completed it. I believe it will allow me to reduce my time spent training yet give me a very solid level of functional strength and movement. This is how my workout week is structured, and notice that my strength and combative sessions are alternating. This seems to allow me to recover better. Notice that I don’t have “cardio” anywhere on my schedule. As stated above, I know that I need to be as efficient as possible, and my end result is to be fit for a fight. My combative sessions, whether I am working strikes on my strike dummy or ground fighting with my partner are the best cardio sessions I can get. They are functional, efficient, and allow me to be accomplishing two goals at once (combative training and cardiovascular fitness). These are just my examples and what work for me. Once you get into your program you may find a better way to lay out your week, just keep it as efficient as possible and stay focused on the goal: fighting fitness. MMA stands for mixed martial arts, and is the result of the first UFC’s that demonstrated how traditional martial arts were lacking certain skill sets. If you are a traditional martial artist, please don’t be offended and think I am saying your system is lacking, just understand that most traditional systems are. If you happened to train in a system that addresses all elements needed for real self-defense, then you are way ahead of most martial artists who are wasting their time scoring points in mock sparring matches. Most martial arts systems have gotten too far from real combat, and have been watered down into somewhat useless techniques. MMA training is generally focused on MMA type competitions, which are semi-realistic full contact fights that allow most strikes and techniques to be used. While MMA is not completely realistic combat, it is as close as you can get and offers an excellent base of skills that can be directly applied on the street. Once you find an MMA gym in your area, jump right in and begin training. You will probably find that if you do not have a strong base of fitness already that these training sessions will be very tough physically. There are some other systems (such as Sayoc Kali and Martial Blade Concepts) out there that are just as good and maybe better than an MMA gym. The problem is that the martial arts world is as complicated and watered down as the fitness world it, and it would be very difficult for me to recommend something specific in the limited scope of this book. Keep it simple and select a place that uses aggressive, simple techniques that will work in the real world without years of complicated training. Once you have a good base, branch out from there. SIRT pistol- great for integrated weapon training. I also use mine to enhance my workouts by using it to practice my weapon strikes, and close range techniques. This is the next logical step in relation to your MMA training and fitness development, and requires that you have a place to do it and like-minded individuals. Multi-level weapons training is like MMA on steroids, and simply means that instead of traditional sparring, you will arm yourself with safe training weapons, and integrate them into you sparring. This will bring a whole new level of awareness and realism into this type of training. If you are new to combatives, and have not been to this type of training before you will need to find a qualified academy or instructor to train with. Some MMA instructors may not understand the integration of weapons into the free sparring, and will probably not be able to teach you what you need to know. This section will have two recommended programs as an option for those of you who would like to follow a dedicated program. These programs are intense, and each twelve weeks in length. I would recommend them to anyone who does not have the experience to develop their own program, or wants to use the workouts to supplement their normal week. 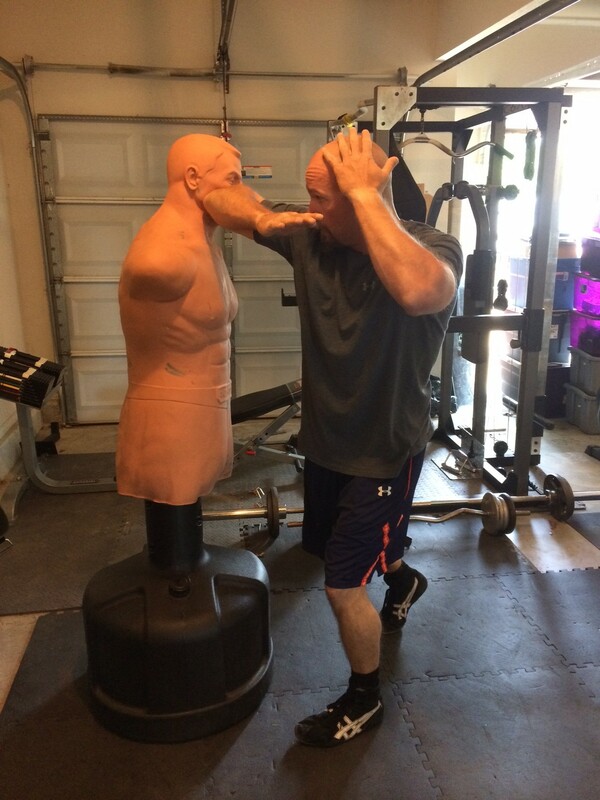 If you follow my advice and begin training in combatives, you might be wondering how you are going to do both. My recommendation there would be to train in combatives one or two times per week, replacing the “cardio” element of whatever workout you choose with the combative session. Eventually you will be able to take the best from those programs and build a schedule that suits your needs. I recommend a couple different physical fitness-training programs, which I have personally used to elevate my fitness levels. I highly recommend that you investigate both programs and utilize them as you see fit. One of the programs is predominantly done as a DVD video-based follow along program, and the other one is in book format. I don’t have any association with either of these companies, and they do not sponsor me to say nice things about them. They are simply the best and most diverse workout programs that I have found that will help you elevate your fitness levels without spending hundreds of dollars on personal trainer or exercise equipment. The key is that they are total programs, which address all of the key fitness areas, and they are relatively simple to follow. Keep in mind the fitness related principles discussed above when using any of the below programs. This program is a very detailed and spans twelve weeks. It incorporates elements of everything needed to perform one’s movements well. It is a very detailed program and can be a bit complicated to follow, but it is well worth it. The workout requires relatively little equipment and can be done at home with a few simple pieces of gear. This workout was designed and built upon the premise of developing core strength called “pillar” strength. The author of this program believes and demonstrates that all movements originate around that pillar area consisting of the midsection, lower back, and hips. If you strengthen this area, then the result is better movement mechanics for the entire body. I used this program as a pre-nationals routine several years ago. I did the program later than I should have, and consequently I had to work through the heat of the summer inside my garage home gym during temperatures exceeding 95 degrees. This may have limited the effectiveness of the program a bit, but it sure got me acclimated to the heat. Overall, I felt the strongest I have ever felt, and moved better than I have ever moved after completing this program. I also have a series of CD’s made by the designer of this program called “Core Essentials”, and find those CD’s useful, but not necessary if you desire to do the 12-week workout in the book. Recommendation: Get the book Core Performance and follow the program. This program in my opinion is the easiest to follow along and I recommend it for beginners. One thing I like about this program is that it is primarily a bodyweight program. While some of the exercises are probably not ones I would focus on, the large majority are. Don’t mistake what I just said as meaning the program itself is easy, just that it is easy to follow along due to its design. This program is an intense 12-week program that can be followed via DVD. It incorporates a very diverse group of workouts and principles that will increase fitness levels in all key areas. The program requires absolute minimal equipment and will work well to increase strength to weight ratios by reducing body fat. The great thing about P90X is that the workout is packaged in a series of twelve DVD’s that you just pop in your player and follow along. The main trainer, Tony Horton, is a gifted trainer operating at an incredible fitness level. Trying to keep up with the trainers on the DVD is very inspiring and fun for those wanting a challenge. If you are new to fitness or have some physical limitations, you may want to start with a preparatory program of some sort before starting this program. Make sure you start in the off-season for this one, as you will want to have the time to dedicate to building a good base of fitness. Recommendation- Get the P90X program and follow the DVD workouts. Note: There is now a P90X2 program out there, but I recommend starting with the base program first. Simple & Sinister will prepare you for almost anything life could throw at you, from carrying a piano upstairs to holding your own in a street fight. Simple & Sinister will forge a fighter’s physique – because the form must follow the function. Simple & Sinister will give you the strength, the stamina, and the suppleness to play any sport recreationally – and play it well. f you are a serious lifter, Simple & Sinister will build your strength, rather than interfere with it. Simple & Sinister will achieve all of the above while leaving you plenty of time and energy to do your duty, your job, practice your sport, and have a life. Recommendation- Get the program and follow it. 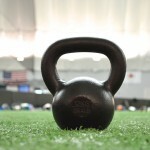 Strongly consider instruction in some of the kettlebell exercises if you are a novice. This article is meant to get you motivated about the importance of fitness in a fight. I also wrote it to reject the theory that “I’ll just shoot them” when a high stress incident goes down that comes from some. Fitness is the key, so use the material I have given you in this post to develop your own system of getting fighting fit. Your life may depend on it! Tony Horton, “P 90X,” P 90X, DVD, prod. Beachbody Inc. (Los Angeles, 2007). Mark Verstegen, Core Performance (Pheonix: Rodale, Inc, 2004). Tony Horton, P90X, 01 01 2004, 01 01 2009 <http://www.beachbody.com/p90x>. Great article! Fitness is needed on so many levels, either comp or defensive shooter! Yes! Yes! Yes! Absolutely love this article! Although, I am relatively new to fitness and weapons and combatives training, this is the balanced approach that I have been striving for. ← Are You A Lion Or Lamb?